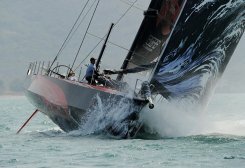 The PUMA Ocean Racing team competes during the stage one start of Leg 4 to Auckland in the Volvo Ocean Race at Sanya, Hainan Island, in February 2012. American-led Puma secured a small but crucial advantage on the Volvo Ocean Race fleet on Thursday after swapping the overnight lead in the 4,500-nautical mile, leg six chase to her home shores. American-led Puma secured a small but crucial advantage on the Volvo Ocean Race fleet on Thursday after swapping the overnight lead in the 4,500-nautical mile, leg six chase to her home shores. A cold front hampered Ken Read’s boat allowing Camper (Spain/New Zealand) and Abu Dhabi to pass her before welcome trade winds propelled her back to the front of the pack and by 1300 GMT she led by more than seven miles. Overall, there was little to split the fleet with around 70 miles separating Puma from tail-ender Groupama which was uncharacteristically struggling to pick up the best of the breezes having won leg 4 and being denied a good chance of another victory in the next stage to Itajai in Brazil by a broken mast.